I was asked by Tiny Township if I would be interested in giving input to their trails master plan. As a result of this request I agreed to attempt to plot out for them some of the old Indian trails and perhaps those used by Champlain, Segard and the Jesuits. Other than the narratives in the primary source documents I have little to work with other than a map prepared by A F Hunter in support of his village site report regarding Tiny. 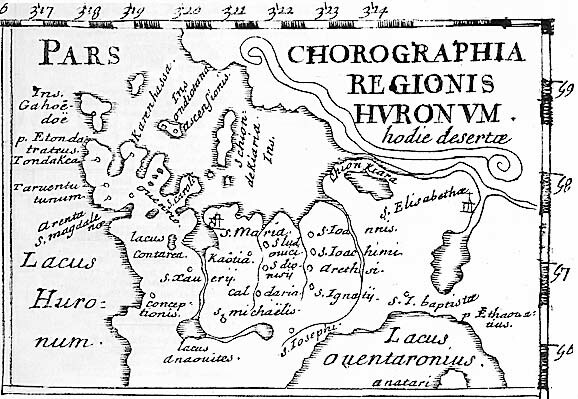 There is another map produced by Dr. Percy J. Robinson (see insert) that purportedly uses the work of A F Hunter and A E Jones to trace the routes of Sagard in 1623. While I do not support legend of the Robinson map as to the routes taken by Segard I will attempt to overlay it with the Hunter and Jones maps in order to plot something out for the Township. Eventually, as we become more informed as to the location of the villages of Champlain, we may well find them on these trails and will be able to publish what we may consider as his route through Tiny and hopefully connect this with the rest of the trail he took to the Narrows at Orillia. Should anyone be aware of other maps that can assist in this project please let me know by was of comment or direct email. I saw an article in one of the South Simcoe papers last week discussing future recreational trail routes that the county would like to start implementing in the next few years, and they quickly mentioned that they were including First Nations routes in their planning process. I sent an e-mail to the head of planning, Bryan Mackell, and told him that he should attempt to reach out to our group (since the article said that they were looking for public input). He wrote back pretty promptly asking when we were meeting next, and if he could present some of their info/plan regarding the trails. Could we slip him into the agenda for the meeting this week, for member's business? Further to this post and previous comment we can know confirm that Bryan Mackell will be in attendance at our May 12th meeting at the Huronia Museum, 7PM. Bryan will be making a Power Point Presentation - "Simcoe Trails & Greenways - The Future. The County is seeking consultation with community groups re future trail development and interested in gaining knowledge re ancient aboriginal trails or perhaps archaeological sites that are on or close to either existing or proposed new trails trails under consideration.